I am not a professional organizer. 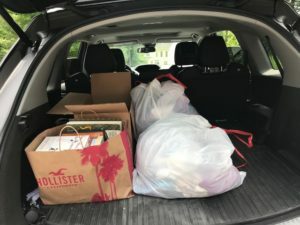 So why am I writing (again) about the benefits of decluttering? It’s part of my story. One of those stories which I hope will offer to you, my reader, a nice moral or lesson at the end. 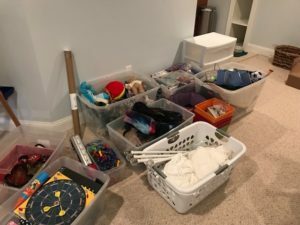 It started last year when I decided to Get Rid of 30,000 Items in My House. That’s right. 30,000 items, or 10% of the approximate 300,000 items inside the average American house. I can’t recall where I read that. Probably in a newspaper article I clipped and lost somewhere in this house along with those 299,999 other items. (You’ll be happy to know, I have since switched to a digital subscription). Since I’ve always thought of myself as “above average,” I probably have more than 300,000 items. Before I read that astounding fact, I hadn’t set out to get rid of anything. But I had been changing things up. I had quit my long-time professional role and left the corporate world to work for myself. I wanted to add value to my life, to discover and act upon my passions, to live my next decade with a new definition of success and a greater sense of purpose. I was seeking fulfillment. I didn’t feel I had enough. 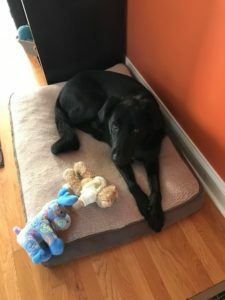 As I started this process, it quickly became clear to me that I had well more than enough, at least in terms of physical items. 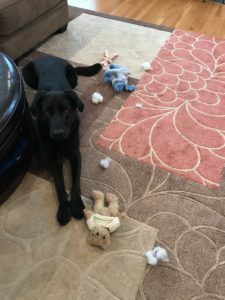 All that Stuff – so much stuff! – surrounding me. It was weighing me down. I realized if I wanted to add MORE of what I wanted to my life, I had to start with LESS of what I didn’t. And so I entered Edit Mode and began getting rid of things that were no longer beneficial to me. Physical/tangible things. And emotional/invisible things. Less worry. Less weight. Less rushing around. Less toxicity. Less clutter. Less time cleaning up and organizing and looking for things among the muck. That’s when I read that I-Can’t-Recall-Where-I-Read-It article that stated the average household has 300,000 items inside. And I thought… that’s just Way Too Much Stuff. When a bin was full, we’d start another. 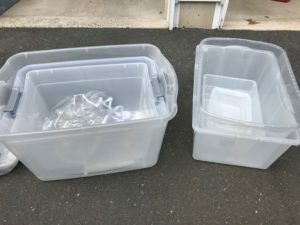 Turns out I had a lot of those plastic bins too. 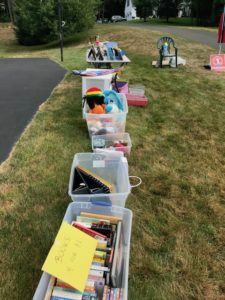 This past weekend we brought the bins outside and held our second “$1 or Less” Tag Sale. Why $1 or less? Because my goal was to get items out of my house yet keep them out of the landfill. I don’t like the idea of throwing things in the trash. I do like the idea of pricing them so low as to practically give them all away. And that’s what I did — what didn’t sell from our bins went straight to Goodwill’s donation bins. We had buyers looking for bargains. And buyers who wanted to buy the bins themselves, so they’d have more room to store more STUFF. practically giving it all away! By the end of the sale, the bins were mostly empty. What a good feeling! The first”$1 or less” sale brought in $130 while ridding my house of 400 items I no longer wanted or needed. This year we cashed in less, only $75, but another 400+ went out the door. That’s more than $200 for crap in my house I didn’t want to begin with and do not miss. I can’t even recall what we got rid of, that’s how little it meant to me. It’s amazing to look at those now empty bins and feel so fulfilled. And yet, I look around the house and what do I see? Still well more than enough. Sometimes what you add to your life comes from what you subtract or take away. I wanted space in my Next Chapter to focus on what matters most to me. And I realized I don’t need all this Stuff. I need time and health and creativity and goals and friendships and family. I don’t need 17 coffee mugs. I just need my favorite one. You’re building your own story… what belongs in it? Are you filling yourself with things you most want and need? Or are you overwhelmed by insignificant “stuff”? Make space – both literal and figurative space – for what you’d like to develop in your Next Chapter. Empty the bins of what’s no longer relevant or necessary. Sometimes we add most to our life what we take away from it. My bins are empty. My life is full. Valerie Gordon still has 10,000 (or so) items to rid from her house. Among them are old Beta-SP tapes and scripts on floppy disks from her award-winning television producing years. She now helps other women “take command” through her career and communication strategy firm Commander-in-She. She speaks at conferences and to corporations and women’s groups about how to apply the principles of storytelling for greater success and satisfaction at work. Find out what clients are saying.